Redcord is a suspension based exercise and functional training system proven to facilitate rehabilitation, fitness and sports performance. In the clinic, Redcord offers hundreds of different exercise choices to help strengthen and re-activate injured and weak muscles. The Redcord system can also be used as an assessment tool to screen for weak links including muscle imbalances and inefficient movement patterns that can result from injury. 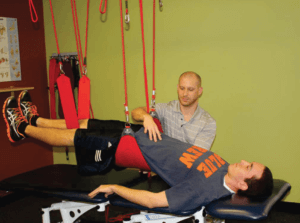 The Neurac treatment method (Neuromuscular Activation) is the approach that combines the patient assessment with a prescription of corrective exercises utilizing the Redcord equipment. The Neurac treatment method is rooted in recognized scientific principles and international research. Studies have shown that pain, injury and inactivity inhibit normal muscle activity and function by altering muscle recruitment patterns and motor control. Essentially, pain deactivates muscle, other muscles work overtime to compensate, leaving the neuromuscular system out of balance. These studies have also shown muscle imbalances to persist even after pain is gone. 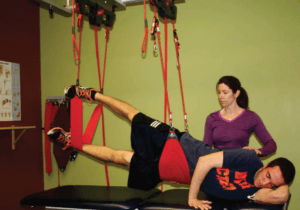 The Neurac treatment method utilizing the Redcord system aims to restore functional movement patterns, reverse undesired or inefficient action and to “reset” the Neuromuscular system. To put it simply, the objective of Neurac treatment is to retrain the body to fire the right muscle, at the right time and in the right amount. Whether our physical therapists‘ goal is to walk without pain, or run the fastest mile, Redcord’s unique system enables the body to strengthen and restore. Regardless of age and condition, it’s the ultimate continuum of care to last a lifetime. Contact us at Battle Creek, Kalamazoo, Mattawan, Plainwell & Portage, MI centers for more information.